I made this cake first for my husband’s birthday two years ago when he wasn’t my husband yet. He loved it and asked for it again this year. This time I’ve decided to improve the recipe slightly by adding vanilla seeds to the truffle. The result was absolutely delightful!!! I’ll never make this cake without adding vanilla again. If you don’t have vanilla bean, use vanilla extract instead, but do not skip on it. This is sooooo much better with vanilla in it!!! 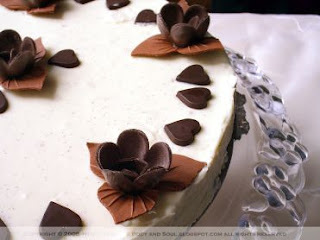 Even though the main ingredient in this cake is white chocolate, the cake is not over-sweet. 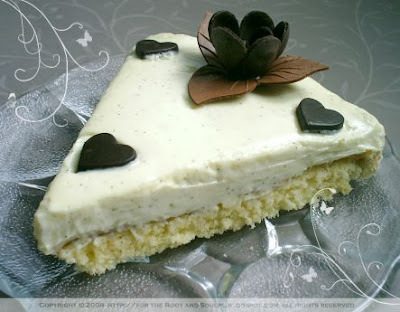 The sponge cake is fluffy and tender with a subtle taste of white chocolate, while the truffle resembles a cheesecake and combines two wonderful flavors –delicate sweetness of white chocolate and intense vanilla flavor. Grease an 8 inch (20 cm) springform pan and flour the base. In a bowl, beat the eggs and superfine sugar with an electric mixer for 10 minutes, or until the mixture is very light and foamy and the whisk leaves a trail that lasts a few seconds when lifted. Sift the flour and carefully fold in with a metal spoon. Fold in the melted white chocolate. Pour the mixture into prepared pan and bake in a preheated oven at 350 F (180 C) for 25 minutes or until springy to the touch. Cool slightly, then transfer to a wire rack to cool completely. Return the cold cake to the pan. Bring to a boil, stirring to prevent it from sticking to the bottom of the pan. Remove the pan from the heat, add the white chocolate pieces, and stir until melted and combined. Allow to cool, then stir in the cream cheese. Pour the mixture on the top of the cake and chill for about 3-4 hours. Remove the cake from the pan and transfer to a serving plate. Decorate. Can I have a piece or two? It looks so tasty! beautiful cake! thanks for the recipe :) love truffle.